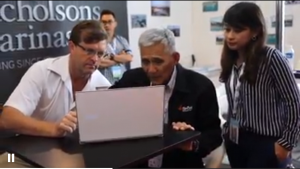 Taking advantage of Superyacht Solutions’ bases in Hong Kong and Australia, two of Superyacht Solutions’ directors, Gareth Ahern and Peter Luke represented Sysol on the Asia Pacific Superyacht Association (APSA) stand at this year’s Singapore Yacht Show. The APSA stand provided a valuable platform for Sysol representatives to engage with both clients and other members of the industry throughout the show. Under the APSA banner a variety of both competing and co-operative companies in the superyacht industry were able to raise awareness and bring business to the region, themselves and each other. 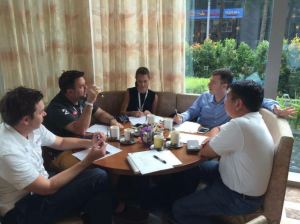 The networking between Australian companies and their counterparts in Asia was brisk and productive. The Singapore Yacht Show provided access to a variety of important representatives of companies who are responsible for the full range of services involved in the yacht industry. As shown below, such opportunities were welcome and capitalized on. 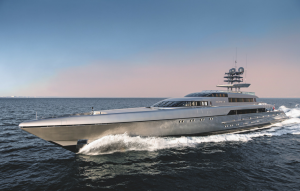 77 metre high speed cruiser MY ‘Silver Fast’ by ‘Hanseatic’ was the prize-jewel on Marina One degree 15 at the Singapore Yacht Show. 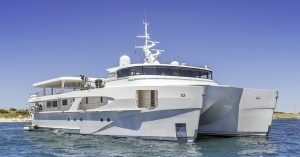 ‘Hanseatic’ have produced a superyacht with all the smooth elegance and prominence a yacht builder can aspire for and all attendees at the show were suitably impressed. Echo Yachts recently delivered the unique 46 metre ‘shadow boat’ MY ‘Charley’ to its Asian owner. These unique features of MY ‘Charley’ provided the diversity and rare designs which are sought-after and enjoyed by visitors to the Singapore Yacht Show. Exemplifying the breadth of skill ‘Echo Yachts’ are capable of calling on to complete a challenging project. Click below to view latest news.